Do I need special paint for synthetic turf? When you make a large investment, like a synthetic turf athletic field, the best way to keep it in tip-top shape is to use the right products that won’t negatively impact performance or sustainability. A race car driver wouldn’t put low-octane, budget gasoline in his or her car. Yes, the engine might actually run, but it’s going to negatively impact the vehicle’s performance. When it comes to paints for synthetic turf fields, you don’t want to simply use paint off of the shelf at your hardware store or even a paint that’s meant for natural grass. Paints that are engineered for synthetic turf are designed specifically to adhere to synthetic fibers and provide either durability or removability. Long lasting synthetic turf paints provide maximum adhesion to synthetic grass blades as well as exceptional flexibility. Removable paints are chemically engineered so the resin system releases from the turf blades when a remover solution is applied. Among the many potential issues that using the wrong paint can lead to are infill binding, which can become a hazard for player safety, or clogging drainage systems. The moral of the story here is that using the right product will ensure that your field remains playable. Before selecting synthetic turf paint, you need to identify if your field is infilled or not infilled, what style your fibers are, and what they are made of. If you are not sure, we suggest you check with the company that installed your field. Knowing what kind of synthetic turf system you have is very important because paint sticks to various materials differently, as it also does to different fiber shapes. For example, nylon turf is more rigid, while polyethylene fields have flexible fibers. A paint that may work really well on a flexible blade of turf may flake off of a more stiff fiber. It may seem overwhelming, but we are more than happy to work with you so you purchase the best paint for your field type and your needs. 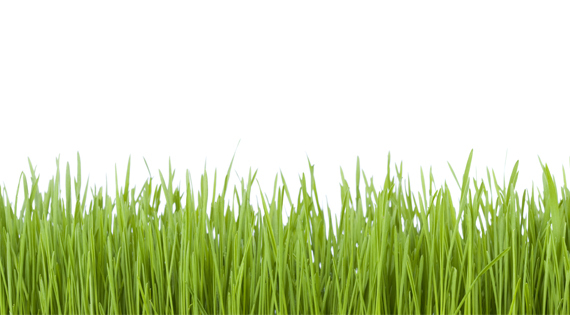 If you want to learn more about synthetic turf systems, we put together a four part blog series that will help you. How long do you want your paint to last? If you already know what type of field you will be painting, the next question you need to answer is what your intentions are for the paint. If you want the paint to last a few games, a removable paint may be what you need. If you are looking for something that is more long-term, then a more durable paint is what you need. Pioneer Athletics has engineered paints that meet these criteria for both infilled and nylon athletic fields. If you are unsure, choose a removable paint. 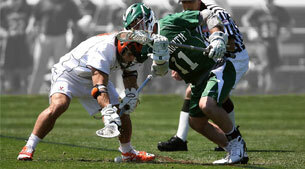 There are many facilities that have installed synthetic turf fields certain that only one sport would be played on it. 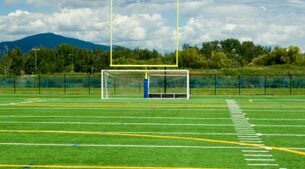 However, after installation, other sports quickly find reasons why playing on the new synthetic turf field is absolutely necessary. Using a removable paint will give you more flexibility in these situations or until you are better able to determine what the actual field use will look like. Choosing which synthetic turf paint is best for you includes deciding if you need bulk paint or aerosol. Bulk paint looks great and affords you many options. Pioneer Athletics offers several different bulk synthetic turf paints – from paints that are removable to paints that are more durable. This gives you options to fit your needs. A benefit of bulk paints is that in addition to a large pallet of standard colors, bulk paints can be ordered as any custom color. This gives you the ability to have logos with your school’s or organization’s exact colors. One thing to keep in mind with bulk synthetic turf paints is that you will need to make an investment into airless striping equipment. With this, you’ll need to factor in maintenance, time to load the paint and clean up time. This is important to know because it may affect the time and staffing needed. Aerosol paints work well in situations with limited staffing and time. Additionally, the prep work that goes into aerosol is pretty simple – shaking the can prior to use. Aerosol paints have a smaller startup cost compared to bulk paints because the machines are less expensive. An advantage of aerosol is that it can be used in inclement weather due to how quickly it dries. If you are a bulk paint user, having a few cases of aerosol on hand can help get you through those bad weather games. Although we offer a palette of aerosol colors, custom colors are not an option. Bulk Paints – If you use one of our bulk synthetic turf paints, you’ll need to use an airless striping machine. Airless striping machines utilize high pressure to atomize the paint as it’s sprayed out. This allows the paint to fully encapsulate the turf blade and it minimizes paint going into the infill. Airless stripers also use less paint. When painting synthetic turf, less paint is better. Many machines have a dial that allows you to choose how much pressure you want to use. 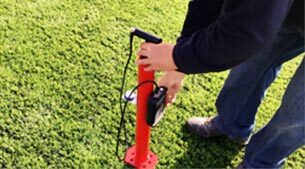 When using an airless machine for painting synthetic turf, we recommend using 900-100 psi with a .317 or .319 tip. Pioneer sells numerous airless striping machines, including a self-propelled model. Aerosol paints can be applied using a handful of methods. The most simple, but not necessarily the most comfortable, is simply spraying by hand. There are also three different tools that can help make using aerosol paints more manageable. The first is an aerosol can pistol, a foot long apparatus that secures the can and uses a trigger system to make spraying the can easy. This tool works well when you are painting logos. The second is an aerosol marking stick, a 2.5’ stick that also secures the can and uses a trigger system. The marking stick can be used for both lines and logos. Finally, there is an aerosol marking machine. This four-wheeled device carries up to 12 cans of aerosol paint. This machine gives you the most control when you are painting lines with aerosol on a synthetic turf athletic field. New in 2018: US Lacrosse & NFHS allow an optional 120-yard unified field layout for boys & girls HS lacrosse. Understanding your athletic field hardness is easier than you may think.